It helps balance your muscle groups. Cross-training helps strengthen your non-running muscles and rests your running muscles. You can focus on specific muscles, such as your inner thighs, that don't get worked as much while running and may be weaker than your running muscles. You'll maintain or even improve your cardiovascular fitness. Many cross-training activities are great cardiovascular workouts, so they build on those similar benefits of running. It reduces your chance of injury. By balancing your weaker muscles with your stronger ones, you'll help reduce your chance of injury. Participating in low-impact cross-training activities, such as swimming or water running, will also lessen the stress on your joints, which are often a sore spot for runners. You'll avoid getting bored with running. Running day after day will eventually burn out even the most hard-core running enthusiast. Cross-training gives runners a much-needed mental break from their sport, which is especially important for those training for long-distance events such as marathons. You can continue to train with certain injuries while giving them proper time to heal. Runners suffering from injuries are sometimes told by their doctor to take a break from running during their injury recovery. But, with certain injuries, it is possible to continue with cross-training. Cross-training can help injured runners maintain their fitness and deal better with the frustration and disappointment of being sidelined from running. The amount of cross-training you do depends on how you're feeling—both mentally and physically. If you're a recreational runner, try to supplement your three to four days of running with two to three days of cross-training. If you're a competitive runner and run four to six days a week, you can substitute a low-intensity cross-training workout for an easy run or a rest day on one to two days week. Cross-training can also be great for runners who are traveling and may not be able to run outside or on a treadmill but have access to other sports. If you're dealing with an injury and sidelined from running, you may need to cross-train more frequently. Talk to your doctor or physical therapist to get advice on how much you should cross-train and what activities are best for your specific injury. Both beginners and experienced runners may hit periods in their training when they are feeling bored or uninspired to run. Cross-training can be a great way to work through those unmotivated phases. Taking a couple days off from running each week to do another activity can help get you excited to return to running. Swimming: Swimming is an excellent cross-training activity for running because it's not weight-bearing, so it gives your joints a break from the stresses of running. It allows you to build strength and endurance, and also improve flexibility. It's a great balance for running because you'll really work your upper body while giving your leg muscles a breather. Swimming is especially recommended for people who are prone to running injuries or are recovering from an injury. Some runners also find it very relaxing and meditative. Water Running: Water running is an alternative for injured runners or as a substitute for an easy running day. It's also a smart way to get in your runs during hot and humid weather. While you can run in the water without flotation aids (vests, belts, etc), you’ll find the workout to be easier with them. Cycling or Spinning: Cycling and spin classes are also low-impact ways to boost your cardiovascular fitness and strength. Cycling exercises muscle groups that are in opposition to those you use most with running, especially your quads and glutes. 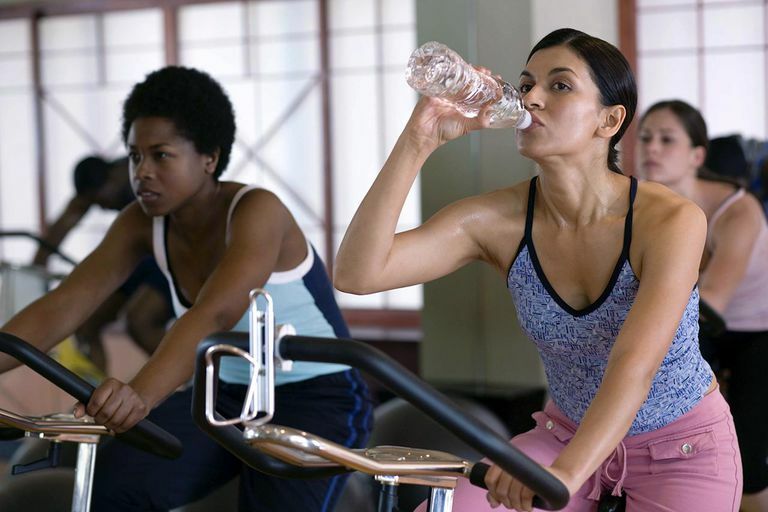 Elliptical: You'll get a total body cardiovascular workout on the elliptical machine. Their oval-like (ellipse) motion provides the user with the feel of classic cross-country skiing, stair climbing, and walking all in combination. You can program the elliptical to move in either a forward or backward motion, so you can work all the major muscles in your legs. Because the muscles used on the elliptical are similar to those you use when running, the machine is a good low-impact alternative when an injury prevents you from running. Pilates: The Pilates method is a form of exercise that emphasizes core strength and flexibility, important elements for running that are often ignored by runners. Walking: Walking is a good activity to substitute for an easy running day, especially if you're recovering from a long run or speed workout. With certain injuries, you may be able to walk pain-free, and speed-walking is a good way to maintain cardiovascular fitness while you're recovering. Rowing: An excellent cardiovascular, low-impact activity, rowing strengthens the hips, buttocks, and upper body. Just make sure you learn the proper rowing technique to maximize the benefits of this activity and avoid injury. Strength (or Weight) Training: Strength training allows runners to improve the strength in their running muscles, create a balance between unbalanced muscle groups, and focus on keeping their legs strong during injury recovery. You can do either resistance training, where you use your own weight for resistance (pushups, for example), or weight training, where you use weights (free or machine) for resistance (leg press, for example). Strength training is an excellent opportunity to strengthen your core, which helps runners avoid fatigue and maintain their form. Yoga: Yoga offers some of the same benefits as strength training since you'll use your body weight as resistance to strengthen your muscles. You'll also improve your flexibility since it involves a lot of stretching. Many runners find yoga a great way to relax after a long run or tough workout. Cross-Country Skiing: With cross-country skiing, you'll get a great cardiovascular workout and focus on many of the same muscle groups as running. You'll skip all of that the pounding on the road, so it's a great cross-training activity for runners with injuries. You'll also work on your flexibility, as the gliding motion stretches your hamstrings, calves, and lower back muscles. And if there's snow on the ground, you can always use an indoor ski machine, which provides a very similar workout. Ice or Inline Skating: Inline or ice skating is also another no-impact sport (as long as you don't fall) and it's a great activity if you're recovering from shin splints, Achilles tendonitis or knee injuries. You'll really work your quadriceps, buttocks, and lower back muscles.